Plump Israeli couscous gets tossed with fresh veggies, hot peppers, and salty feta cheese and kalamata olives to create a unique twist on the classic Greek salad. Summer isn’t over just yet, and I’m willing to bet you have some summer veggies still lingering in the garden. This Greek Israeli Couscous Salad is light, filling, and loaded with fresh veggies, hot pepper rings, and salty feta cheese and kalamata olives. 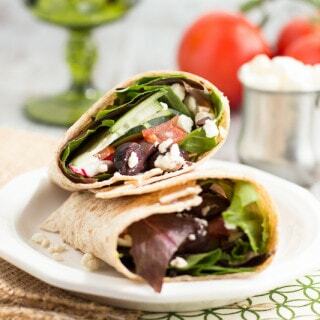 The entire salad gets drizzled with homemade Greek salad dressing made with a few pantry staples you probably have handy. Now that I work from home full-time, I’m always looking for new ways to add pizazz to lunch–I’m so not a ham sandwich kind of gal. Since I don’t always have time for a real lunch break, I usually reach for items that I’ve made ahead and stored in the fridge for easy access during the week. I do all of my prep work on Sunday so that all I have to do during the week is scoop and dump. After I grab a fork, napkin, and a bottle of my favorite root beer, I head back to the office to put in some hard labor at the computer search Pinterest and stalk old high school friends on Facebook. Bring water to a boil in a medium-sized saucepan. Add the couscous and a pinch of salt. Turn the heat down to low and cover the pot. Simmer for 8-10 minutes, or until the couscous has absorbed most of the water. Remove the pot from the heat and allow the couscous to rest with the lid on for 5 minutes. Fluff with a fork. Transfer the couscous to a large bowl. Fold in the remaining salad ingredients. Drizzle the dressing over the salad and gently stir to combine. Cover the bowl and place in the refrigerator to chill. In a small bowl, whisk together the red wine vinegar, mustard, honey, garlic, and oregano. Slowly drizzle in the olive oil while you continue to whisk the mixture. Season with salt and pepper to taste. I could really learn from your ways – I love the idea of making a big batch of something or other on Sundays to eat for lunch during the week – I’m usually clueless as to what to eat during the working hours, ha! Loving all the Greek flavor and those big puffy coscouseses look so good! Delicious! Grain + veg always equal my favorite sort of salad.